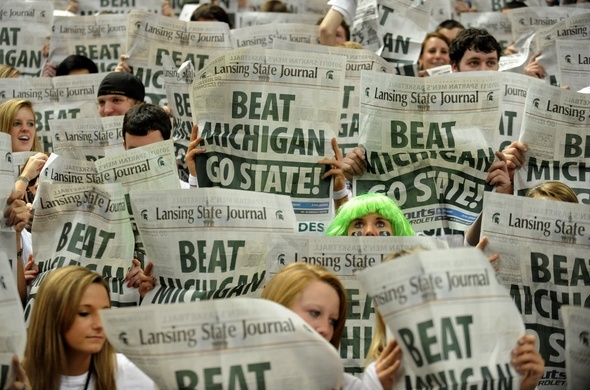 Posted on Sun, Feb 5, 2012 : 5:59 a.m.
Michigan State fans hold newspapers up as the Michigan basketball team is introduced last season at the Breslin Center in East Lansing. The Wolverines won, 61-57, and go for their fourth straight win against MSU on Sunday. History and the 2012 Big Ten title race will take center stage Sunday when the Michigan basketball team visits Michigan State. When's the last time anyone said that? The 23rd-ranked Wolverines (17-6, 7-3 Big Ten) will look to make it four in a row against the ninth-ranked Spartans (17-5, 6-4 Big Ten) for the first time since 1998 in a nationally televised game (1 p.m., CBS) at the Breslin Center. With a win, Michigan will take its second straight sweep of MSU and earn an outright tiebreak in the Big Ten standings entering the stretch run. 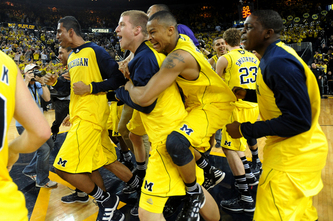 Michigan players celebrate their 60-59 win against Michigan State on Jan. 17 at the Crisler Center. The Wolverines' third straight win shifted the pressure of the rivalry to Michigan State. Michigan has won three straight games in the rivalry, and for the first time in a long time, Michigan State has actual pressure on it to get a win against the Wolverines. With Michigan snapping an 11-year East Lansing losing skid a year ago, Spartan fans seem to actually have doubts about who the better team is for the first time in a decade. After last month's loss in Ann Arbor, a frustrated Tom Izzo had to deal with several "is the gap closing" questions, a situation he was less than comfortable dealing with. On the flip side, it's not like Michigan is playing with house money here. The Wolverines are in the midst of their first Big Ten title race in years, and Michigan hasn't captured a regular-season Big Ten title since 1986 -- when John Beilein was coaching at Le Moyne College. A loss against the MSU will cost Michigan a tie-break opportunity against one of the league's top-tier teams. And it will only continue the growing argument that the Wolverines aren't the same team away from the Crisler Center. Which side has more pressure on it? It shouldn't take long for us to find out. During the first meeting in Ann Arbor, Beilein shook things up by removing the 6-foot-9 Evan Smotrycz from the starting lineup in favor of the 6-foot-3 Stu Douglass. To the naked eye, the move seemed strange, as Michigan State holds a considerable size advantage regardless of what lineup Beilein opts to go with. However, it more than paid off in the end. Michigan State had trouble running with Michigan's small, but speedy, five and any rebounding edge the Spartans may have had was rendered ineffective with the Wolverines' ability to get back on defense. Zack Novak was able to give Draymond Green fits at both ends of the floor, Jordan Morgan held his own inside with Derrick Nix and Adreian Payne, and Michigan's mini-lineup was a major factor in the Wolverines' one-point win. Michigan State will certainly adjust to the small lineup this time around, but even still, Beilein's small lineup could provide a big advantage. "(Novak) has been guarding (bigger players) for four years," Beilein said. "When we talk about some of the big men he's guarded, I think Blake Griffin's on the list way back when. "When you have any doubts, go small." Michigan State's Keith Appling (left) and Michigan's Trey Burke go head-to-head last month. This may not be a one-on-one matchup for the full 40 minutes, as Michigan State may rotate defenders against Michigan freshman point guard Trey Burke. But once again, the team that gets the better performance from its point guard should be able to win the basketball game. In Ann Arbor, Burke had a game-high 20 points in 37 minutes of action, while MSU point guard Keith Appling finished with just 10. And, making matters more interesting, Izzo said Appling was "walking on his knees" after just 31 minutes of play. Burke's ability to control the game early with the high pick-and-roll and consistently knock down the open 3-pointer gave Michigan a double-digit lead. If he can excel in both areas again, Michigan will be tough to beat. Appling, meanwhile, could have some extra pressure on his back Sunday due to Green's sore knee. Green or Appling can struggle and Michigan State can still win the game. But MSU can't afford rough efforts from both. If Green's limited, Appling can't be off. Anyone interested in watching two captains give absolutely everything they have for 40 minutes should fixate their eyes on No. 0 and No. 23. Novak and Green are the heart and soul of their respective programs, and they'll also be facing off against one another. Novak (6-foot-4, 200 pounds) gives up a ton of size to the 6-foot-7, 230-pound Green, but he's been able to hold his own against the MSU power forward over the past three meetings. Green is Michigan State's best player, but has struggled throughout his career against Michigan and he's dealing with a knee injury. Legacies are at stake Sunday for both players. Should Novak help Michigan win four straight, he'll be remembered as the Wolverine captain that helped turn the rivalry's tide. Green's been to a pair of Final Fours, and no one will ever be able to take that away. But should he finish his career with four straight losses to Michigan? Well, some of that luster might wash away. Novak and Green are two classic examples of true student-athletes, and two of the best leaders in the game. On Sunday, they may be squaring off for the final time. I suggest you enjoy the moment. Sun, Feb 5, 2012 : 3 p.m.
Nice reporting there Lansing State Journal. So much for integrity. The picture is worth a thousand words when you report anything on Michigan we will understand the untruthful slant with which you report. The hatered you spew on the state of Michigans best university is despicable. Sun, Feb 5, 2012 : 8:37 p.m.
Rich, logic wins. Nice work. Sun, Feb 5, 2012 : 4:14 p.m.
Lighten up engineer...that's not hatred being spewed, just a good ol' fashioned rivavlry with everyone getting into the spirit of it. Thanks Nick, for a solid job of covering UM basketball this season. And thanks for always remembering to give pertinent info such as when the game is, what time and on what network. Amazing how many other dim-witted &quot;journalists&quot; forget to include such obvious info in their articles. Sun, Feb 5, 2012 : 3:55 p.m.
Hey, Engineer. Sorry you don't like the choice of photo, but I thought it summed up &quot;Michigan at Michigan State&quot; quite nicely -- particularly since we've used up about 10 UM vs. MSU action shots from previous games over the past week. Certainly no hatred was intended to be spewed on any university.